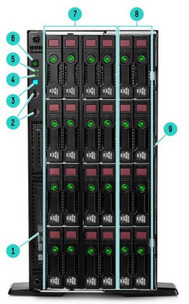 A reverse image search of your picture reveals that it's of a HPE Proliant ML350. Pdf with lots of info. Thanks :). And that machine looks like a monster; imagine having all the money in the world and filling such a machine with SSDs or 15K SAS drives. We use plenty of 1U and 3U rack servers in our data centres at work, but it’s very different seeing this kind of capacity in a tower machine. Those server PSUs also look like they’d be just as loud as those rack servers, so presumably you’d want to stash this as far away from general human habitation as possible.